Hoof care is part of initial training for riders. While external care is important, the quality of the hoof can be significantly improved by nutritional management, the objective of which is faster and more solid horn growth. 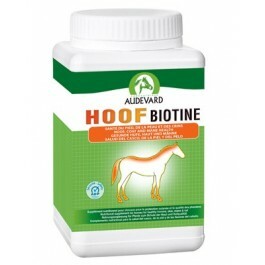 Hoof Biotine has been the biotin gold standard with veterinary surgeons for more than 20 years, as it provides not only 20 mg of D-biotin per day, but 14 essential micronutrients and a complex of four carefully selected plant extracts. Comprehensive formula, which combines specific micronutrients and plants. 1 kg. Sufficient for up to 40 days use in adult horse. Raw materials: Dicalcium phosphate, calcium carbonate, barley, sugar beet molasses, carob, ginkgo (Ginkgo biloba), chrysanthellum (Chrysanthellum americanum), sodium sulphate, methylsulfonylmethane (MSM), flower of sulphur, anise (Pimpinella anisum), hawthorn (Crataegus oxyacantha). vitamin C 5,000 mg, 3a314 niacin 5,000 mg, pantothenic acid 4,000 mg, 3a316 folic acid 1,500 mg, 3a890 choline (chloride) 1,250 mg, biotin 800 mg, inositol 750 mg, E672 vitamin A 500,000 IU. 3b Trace elements: E6 zinc (chelate and oxide) 40,000 mg, E1 iron (ferric oxide) 6600 mg, E4 copper (chelate and sulphate) 3,000 mg. 3c Amino acids and their salts and analogues: 3c301 DL-methionine 120,000 mg, 3c3.6.1 L-arginine 60,000 mg, 3c391 L-cystine 30,000 mg. Technological enhancers: apple flavouring. Analytical constituents: Humidity < 10%, raw ashes 42%, calcium 12%, sodium 0.96%, phosphorous 4%, sulphur 6.2%, magnesium 1%. Ekyrenal + is a complementary feed by AUDEVARD Laboratories. It is designed to provide horses with the nutritional support they need after exercise, rich feeding or season change. It can also be used in older horses.